Breakfast casseroles are my best, busy morning friends when I need to make sure that the whole family gets off to a well-fed, powered start to the day. Everyone in my house is up and off to work and school at slightly different times. That staggered start to the day makes warm breakfasts a little challenging at times! I try to make a large breakfast casserole at least once a week. Individual servings are easy to reheat on busy mornings--and are even easy to pack up for a breakfast on the go. 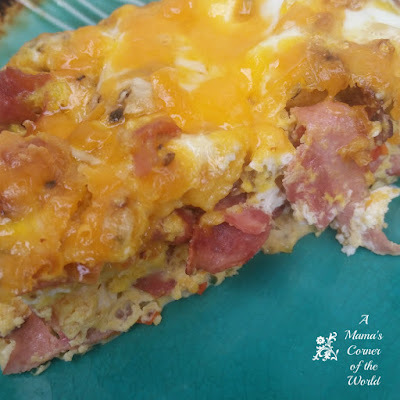 This morning, I put together this Bacon, Egg & Cheese Breakfast Casserole recipe for the week. Shredded Colby Jack Cheese, Hot Sauce or Prepared Salsa, Optional. Preheat Oven & Prepare Casserole Dish. Preheat oven to 350F and spray an 8x8 Glass Baking Dish with Cooking Spray. Saute the Vegetables and the Turkey Bacon. Add 2 tsp. Olive Oil to a medium skillet and heat until hot--but, not smoking. Add the bacon and the vegetables to the pan. Saute over medium heat until the turkey bacon is cooked and the vegetables are tender. Build the Bacon, Egg & Cheese Casserole. Place the bacon and vegetable mixture into the bottom of the baking dish. Sprinkle the shredded cheese evenly over the top of the bacon mixture. In a small mixing bowl, beat together the milk, eggs and the salt and pepper or spice blend. Bake, Cut and Serve. Bake 30-35 minutes or until the eggs are set. Slice into squares and serve warm--garnished with a sprinkle of extra cheese, salsa or hot sauce, if desired.